Mirasol At Coconut Point Homes: Ideally located! Walk to some of the best restaurants, entertainment and shopping available in Southwest Florida! Rare opportunity to own the most sought after floor plans in Mirasol. This spacious and open townhome comes with a split 2 car garage and a sunny Eastern exposure backing up to the Spring Run golf course. Upgrades are numerous including granite counter-tops throughout, tile on diagonal, downstairs half bath, stainless steel appliances, 42" cabinets, upgraded lightning and much more. Mirasol at Coconut Point is a pet friendly, maintenance-free, gated community of only 200 doors. Amenities include a resort style pool with rock waterfall and spa, community room, game room and fitness center. Residents of Mirasol enjoy walking across the street to the Coconut Point outdoor mall which offers an abundance of shopping with over 100 retail stores, more than 20 restaurants, a 16 screen movie theater, and other forms of entertainment such as live music, art shows, and a seasonal farmers market. This highly sought after community is also located close to an international airport and just minutes to the award winning beaches of Southwest Florida. Schedule your private tour today! 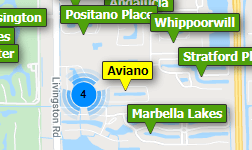 Need professional assistance selling your property at Mirasol At Coconut Point Estero? Find out how an Area Specialist can help to generate more property exposure in order to get the most money for your investment in the least amount of time.